Her answer was better than I can paraphrase. It included being tired of her heaviness, her baggage, and ready for cleansing. I listened and wanted to feel the way she did, and now, with Great Lent only 3 weeks away, I will ask God to help me hunger after this time of self-denial and spiritual growth. We are encouraged to associate Lent with fresh air, with the wind blowing on the hills, with the coming of spring. Lent is a time for flying kites–a time for adventure, exploration, fresh initiatives, new hope…. It also has to do with freedom…. Lent is a time when we learn to be free…. As a human person in God’s image, I am not truly free unless I have learnt how to use my freedom rightly, and this process of learning presupposes obedience, discipline and self-denial. Freedom is not only a gift; it is a task….Lent is concerned, first, with the offering of the world back to God in thanksgiving…. I love that. It’s not about self-depracation and groveling. It’s about seeing ourselves as God sees us. Yes, seeing our sins and repententing of them. But also seeing God’s gifts come to fruition as we labor. Freedom means freedom from slavery to self and harmful passions, but also freedom to be all that we can be. The complete services for Great Lent are contained in a book called The Lenten Triodion. 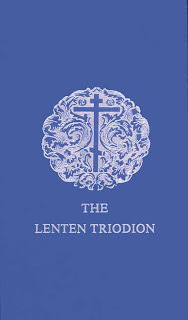 The Lenten Triodion derives its name from the Greek word meaning “three odes,” since the Canon of Matins is based on only three of the scriptural odes or canticles, instead of the usual nine. If you’re Orthodox (or just curious) and would like to know the readings for these weeks of the Church year but don’t want to buy a book, you can find may of them here. The past weekend was full of beauty in so many ways. On Friday night I attended a reception for the students in the Masters of Art Education program at the Memphis College of Art. Just visiting the building itself, especially at night, is a treat. My invitation came from one of my Goddaughters, Julie Stanek, who teaches art at Rossville Academy. Julie’s work at the show included several groupings in oil… like these sunflowers. And this piece, showing a beautiful butterfly on an interesting tree branch. Congratulations to Julie and the other students on an excellent show! It was fun to run into Andrew Dycus, a classmate of my oldest son’s back in middle school! And I also enjoyed a sneak preview of the Works of Heart Valentine Auction being held the following day. My friend Daphne came over from Little Rock that evening, and the next day we took off for Oxford, where the Oxford Film Festival was in progress. We were too late to join our friends, Doug, Herman and Ginger at the 10:30 a.m. showing of “Neshoba,” so we did a little shopping at Square Books instead. I was excited to find Jayne Anne Phillips’ new book, Lark and Termite, and to learn that she would be reading and signing in Oxford on March 10. I also grabbed a signed edition of Francine Prose’s latest novel, Goldengrove. We were honored to have lunch with the author, Jere Hoar,who had been one of the guest speakers at last summer’s Yoknapatawpha Writers Workshop. It was fun to talk with Jere about writing projects and buying land around Oxford and other pursuits. Later we met up with Doug at Off Square Books, and the three of us headed out to the country looking at land. Doug wanted to show us Larry Brown’s property out in Yocona, just outside Oxford. Doug had attended Larry’s funeral back in November of 2004, and hadn’t been to the site since. We felt like we were walking on sacred ground, as we explored the dock by the pond. “The Shack,” where Brown did much of his writing. And his grave. The smaller grave is from an infant daughter. (Brown has other living children.) Larry was four months younger than me, so he died when he was only fifty three. I’ll just let these pictures speak for themselves, other than to say that I could hear the wind in the trees. I think the last time I heard the wind in the trees was two years ago when I was visiting a monastery up in Michigan. Yes, Daphne, I know I need to get out of the city more. I get that. I just don’t want to sleep on the ground in a tent. Back in town we met up with Michelle at High Pointe Coffee, then joined Tom Franklin and his wife Beth Anne Fennelly for drinks on the balcony at City Grocery, and eventually walked three doors down to The Lyric where Beth Anne was master of ceremonies for the Oxford Film Festival’s Awards Ceremony. There were a few film clips and lots of champagne, but the food line was too long, so we left hungry but happy from another day full of friendship and art and nature. This gorgeous weather, as well as the approach of Great Lent, are such complimentary preludes to spring. Yep, it’s 72 degrees on February 9 here in Memphis, Tennessee. I’m going to sign off now, and head down to Harbor Town, to walk by the Mississippi River, and maybe do a little reading or writing….